As a follow-up to one of our Steps to Everyday Productivity Q&A calls, Jill, a member of the LearnDoBecome team, recorded this video to give us a peak into her Asana system. 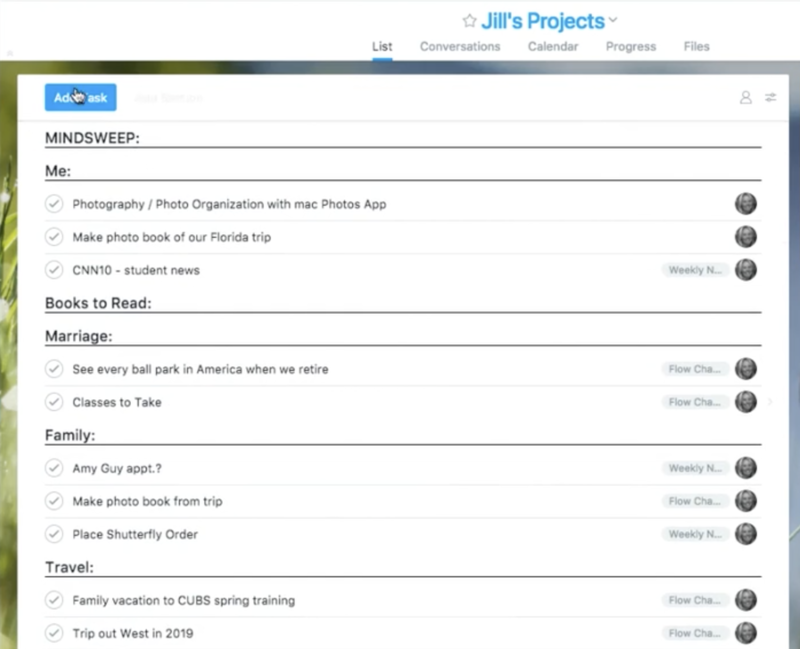 Using the new “boards” feature, Jill organized and streamlined her “mind sweep” of ideas, projects, goals, needs and wants. While this is simply showing one way you can use Asana, we hope some of the ideas here can work for you. 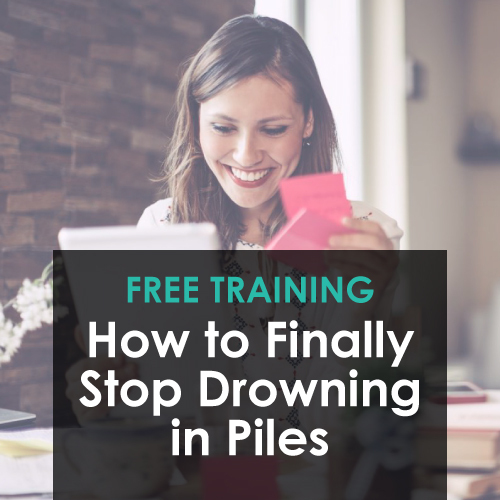 Watch the video to get all her tips for optimizing your system! You can sign up for your own free account with Asana here. You can move an entire section without losing your heading by clicking on a section heading, holding the shift key and using the arrow keys to go down as many rows as needed. Once the section is highlighted, drag and drop the section to where you want it! If you struggle with capturing ideas in the moment, consider using Siri (or another virtual assistant) to get the ideas into your phone – and then move them from Reminders into Asana during your weekly review. Jill loves to pair Asana with Evernote, creating a seamless system throughout your devices. She uses Evernote to keep long term items – kids’ sport schedules, recipes, handwritten notes and more! Evernote serves as an amazing online filing system, while Asana is an excellent tool for project management, breaking projects down into tasks. If you would like to use Asana for work and home, you can use two different browsers, so that it will automatically pull up the correct one, and you can easily toggle between both. 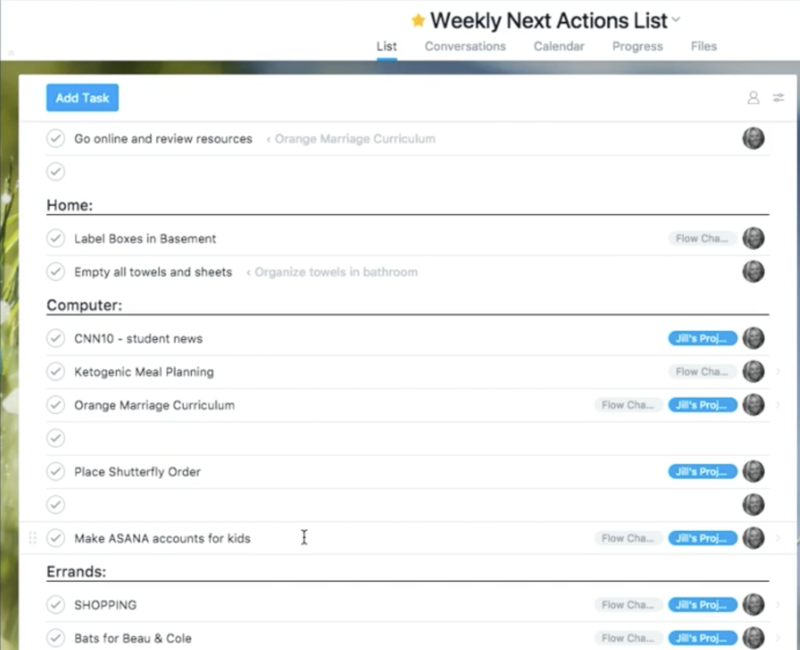 Do you want to review another way to set up Asana to manage routines and projects? Check out the podcast April recorded here! Regardless of where you keep your projects, the key is to find what works best for you! We want you to invest some time optimizing your system, so that it fits your needs and preferences. What are some things you’ve done to set yourself up for success in your projects – on paper or digitally? Share your tips in the comments below! 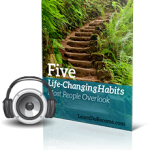 Are you new here at LearnDoBecome? We have two great ways for you to join the party! Can you share an example of your daily/weekly/monthly/quarterly/semi-annually task list? I would love to see what you had in Evernote to get some inspiration based on your experience! I’ve been setting up Asana since yesterday, and I am LOVING it so far! Jill – I just started using Asana a month ago. I loved this video! What a great way to set up for cross-categorization. Thanks so much! Just wanted to say you can see your “done” tasks by clicking on view – all tasks (or completed or incomplete) on your boards. Are you using the paid or free version of Asana? I just can’t say enough of how much I love this handy application!!! Thank you SO much for sharing this very useful and informative video! I had not heard of “Asana” until I saw this. I went right away to give it a look and I am LOVING it! Thanks for adding to my growing knowledge. So very glad you are enjoying, Asana! I am in my account every day and it feels so good to get everything out of my brain and into an organized format that just “works” for me! Thanks for sharing this, Jill! I’m excited to learn how to better use Asana. Unrelated question: 🙂 How did you record the video with yourself in the corner? What software did you use? Thanks! Hi, Andrea! I used Loom (useloom.com) and it is super quick and simple to get going! 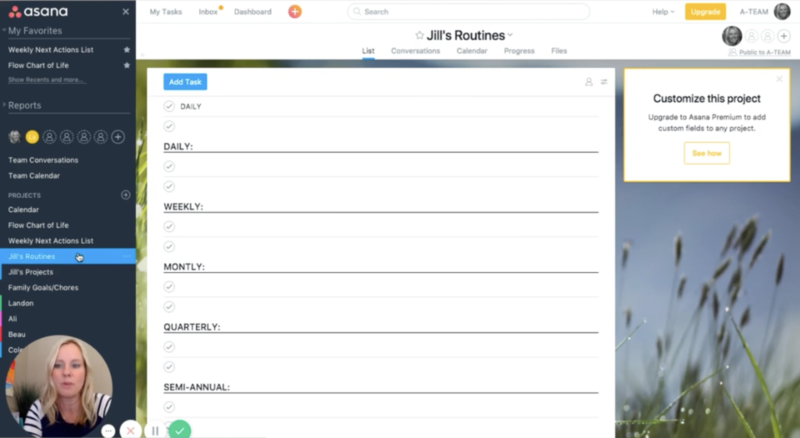 Thanks so much Jill, for opening up your process and letting us see the utility range of Asana. These kinds of tutorials are very helpful and inspiring. I’m sure there are many more like me who have to see someone using apps to really see if they’re right for us and the way we think. Is there a way to take a subtask from a project and populate it on the next actions list? I’m following the recommendation of breaking projects down into individual tasks and the putting a specific task on my next action list. I would love to this with Asana! Yes. Either by sharing the task with another project or using tags. Outstanding video walkthrough & explanation, Jill. Thank you SO much! I’ve been a STEP member for almost two years now, and the high level of care coupled with the deep knowledge you all continually share with us never ceases to amaze me. Much gratitude! Thanks for the nice overview of how you are using ASANA. The boards look interesting. Now that you are a few months in, are using them more or less? Just curious, a best practice is always evolving. Thanks. I am continuing to use and evolve my system, and I am finding myself more thankful than EVER for Asana! 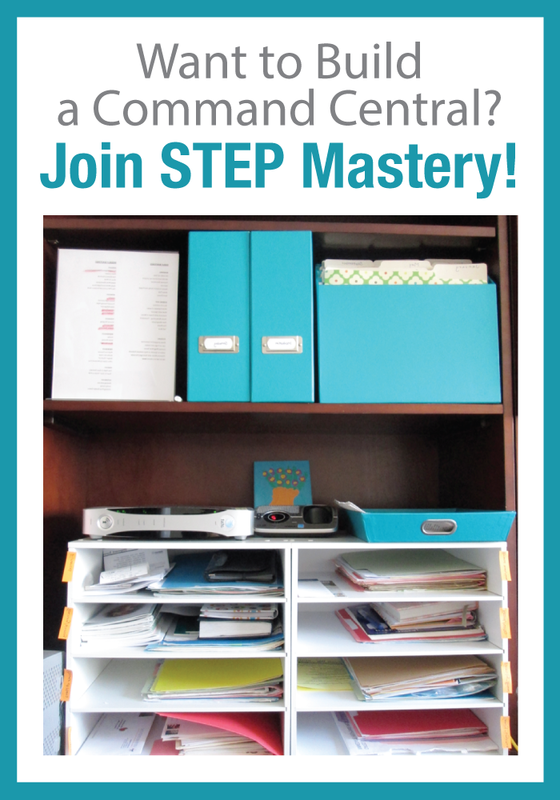 It is just fantastic to have a place to store, organize, and have a task list all in one. I don’t know of any other application as efficient as Asana! 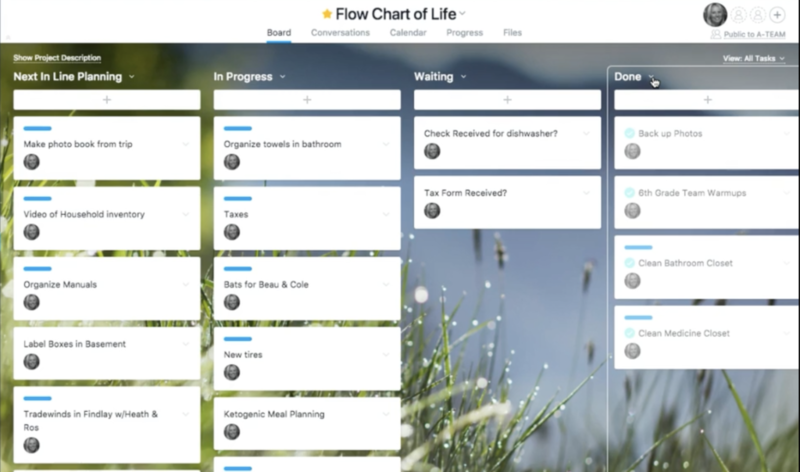 Now, getting my kids involved and using Asana has proved to be a bit more of a challenge this summer, but for me personally, I continue to love the integration of the flowchart, projects, and weekly next actions list. I hope you are enjoying Asana as well!